The next time you fire up the barbecue, try making these colorful chicken and vegetable skewers. Toss chicken with half the dressing. 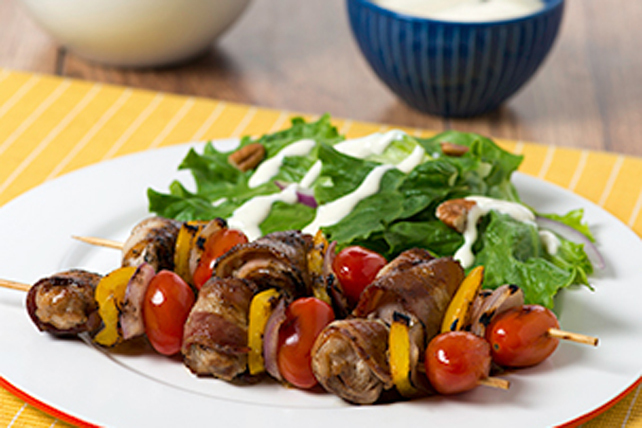 Wrap 1 bacon piece around each chicken piece; thread onto 8 skewers alternately with vegetables. Place skewers on barbecue grate. Grill 10 to 12 min. or until chicken is done, turning occasionally and brushing with remaining dressing. If using wooden skewers, soak them in water for 30 min. before using to help prevent them from burning on the barbecue. Serve with a side mixed green salad drizzled with your favourite Renée's Vinaigrette.